We often drive to the west coast of the peninsula to watch the sunset. There are some great viewing spots on top of high cliffs where you can enjoy soft hues in a colorful sky. There are some place markers on our google map here. 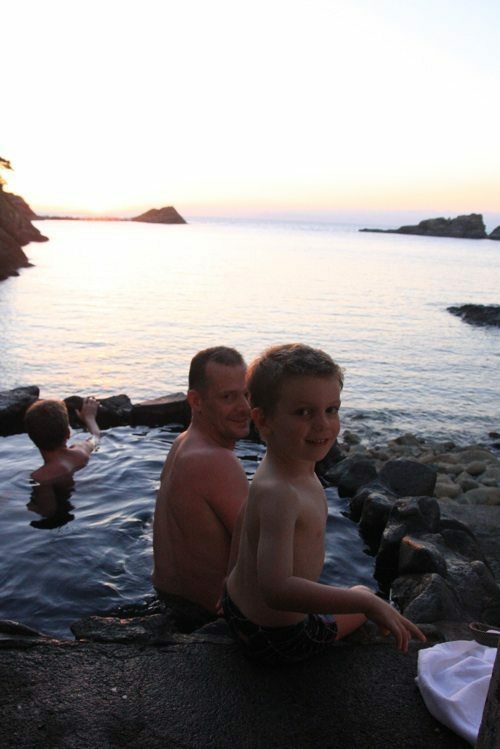 Drive another 30 minutes up the coast and there are several free onsen to enjoy. Onsen water near the sea is usually a bit salty and called “ensen” in Japanese. This onsen has only one small bath, is konyoku (mixed bathing but swim suites are optional), not that hot (about 37 or 38 degrees), and not very easy to find. There is also very little parking and can be a little busy on weekends during the summer months. If you go at night you will definitely need a flash-light. As you can see, the best time to visit though is while the sun is setting. We took this Swiss family to enjoy one of our favorite spots with us. This adventure (a windy ride through mountain roads followed by a hike down a steep path) naturally lead to more “off the beaten track” stories like a near miss lighting strike on a trek in Mexico! Thanks for joining us, Jobin family!